Marquette professor Dr. Robert Smith asked the audience at the fifth and final installment of MKE Monumental, a series of community dialogues, to say the first thing that came to mind when thinking about the civil rights movement. Violence, anger, youth, sacrifice and pride were among their answers. 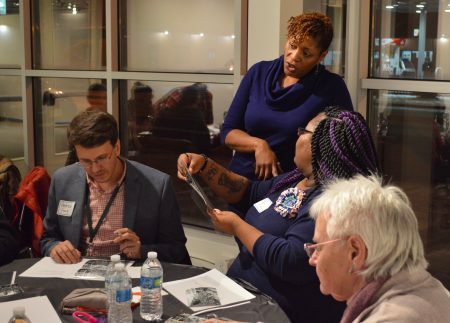 The event, which was facilitated by Still Waters Collective founder Dasha Kelly and the Zeidler Center for Public Discussion, included a historical presentation and also gave participants a sneak peek inside the exhibit section of America’s Black Holocaust Museum, which is about 25 percent complete. For some of the attendees, memories of the city’s civil rights history are very much alive, while others were hearing about it for the first time. An evening of storytelling, open dialogue and meme-making brought these community narratives together under one roof. Lifelong Milwaukeean Noel Waheed, who lives on the North Side, said he enjoyed writing in silver Sharpie over black-and-white photographs depicting scenes he remembered, and then transforming them into memes. The Rev. James Groppi was an advisor for the NAACP Youth Council in the 1960s. Waheed thumbed through photographs of Groppi and Vel Phillips, the first African-American woman to serve on Milwaukee’s Common Council and to become a judge in Wisconsin. Phillips was instrumental in the fight for fair and open housing. 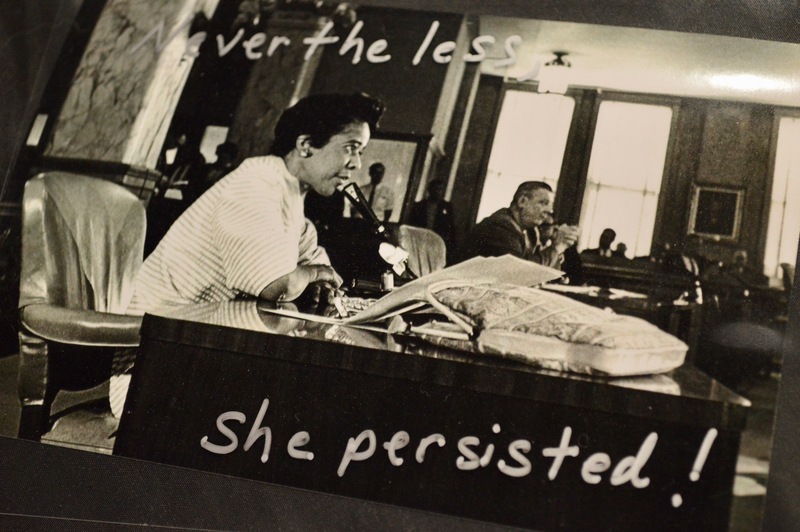 One meme pictured a young Phillips on the Common Council with the caption, “Nevertheless she persisted,” referring to a statement popularized by the feminist movement in 2017. It brings together Vel Phillips’ unwavering commitment to open housing with the persistence of Sen. Elizabeth Warren in her opposition to the confirmation of Sen. Jeff Sessions for U.S. Attorney General. Adam Carr, who delivered the historical presentation with Smith, said that in the 1960s, NAACP adults were nervous about the Youth Council’s actions and “thought that a nerdy-looking white priest would calm them down.” Groppi, however, followed the lead of the young members, Carr said. He added that rather than going to after-school activities such as basketball or forensics, Milwaukee’s Youth Council members marched 10, 15 or even 20 miles for 200 consecutive days. Mary Arms, who marched in 1967 for open housing, said it means a lot to her to see people, especially youth, discussing the implications of Milwaukee’s long black freedom struggle. Kelly added that young people are heading in the right direction, but the community needs to invite them to engage more in conversations about Milwaukee’s incomplete historical narrative, which is biased against people of color. “That gives them the invitation to change how they see themselves,” Kelly said. They aren’t going to have all the answers right away, because they have algebra and Snapchat to contend with, she said. History can be easily forgotten, especially when people don’t see themselves reflected in their own city, Kelly noted. She said that Milwaukee lacks reminders of important civil rights stories, and the history that is taught in schools often lacks positive representations of young people of color, which discourages the habit of inquiry. “You interact with other neighbors who have been conditioned to see you in a particular way or to not see you at all,” Kelly said. She noted that she lives near a part of the Underground Railroad, which was used to help former slaves escape through Wisconsin to safety in Canada. However, the sign marking the bus stop is bigger than the historical marker for the Underground Railroad, she said. When the Home Owners Loan Corp., a federal agency, started assigning grades of A for “best,” B for “still desirable,” C for “definitely declining” or D for “hazardous” to communities throughout the nation in the 1930s, the D or “red” areas designated African-American communities. Despite this, areas rich in black cultural history, such as Walnut Street in the 1940s, 50s and 60s, had the highest concentration of black-owned businesses in Wisconsin, Carr said. Other D areas included the South Side, where Latinos and Polish immigrants lived. “What they are saying with these maps is that if you are a bank or an insurance company it’s too risky to invest in one of these red areas,” Carr said. This process, known as redlining, played a large role in sparking the initiative for fair and open housing in Milwaukee. Carr said that African-Americans grew extremely frustrated because they could afford better housing, but were denied loans and opportunities because of their race. Event facilitators are working to find funding for a route of historical markers that would help to better commemorate the important battlegrounds of the city’s civil rights movement. Places such as the second Youth Council Freedom House or Kosciuszko Park, which was the destination of the original open housing march, have become virtually invisible. Brad Pruitt, ABHM’s interim executive, said that sharing stories and images from the past plays an important role in changing the perception that Milwaukee is, first and foremost, one of the most segregated cities in America. Dr. James Cameron, who founded the original museum and is one of the only known survivors of a lynching in American history, spent a lifetime dedicated to acknowledging the truths of Milwaukee’s civil rights history, according to Pruitt. Who’s looking for funding for markers for the Underground Railroad? How much do they need?